Started as mobile messaging app characters, the characters of Kakao Friends have now been named the most popular in South Korea, beating out the former No. 1, the eponymous character from “Pororo the Little Penguin,” the Korea Creative Content Agency said Wednesday. The Kakao Friends are eight characters introduced on KakaoTalk in 2012. They remained outside of KOCCA‘s top 10 list until 2014, but moved up quickly, seizing the second spot in 2015. Continuing its popularity, Kakao Friends ranked No. 1 last year with 14.3 percent of the vote, according to a survey conducted by KOCCA, the first time for the country’s mobile messaging app characters. The survey asked some 1,200 domestic consumers about their favorite characters. Pororo, which had sat atop the list for several years, took the No. 2 spot with 9.8 percent, followed by Japanese characters Shin Chan of manga “Crayon Shin-chan” and One Piece of a manga series of the same name, with 6 percent and 4.9 percent, respectively. 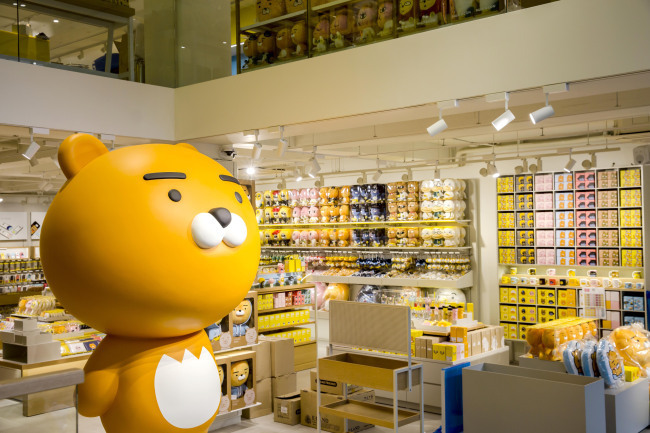 The success of Kakao Friends has largely been attributed to the company’s KakaoTalk, which has some 10 million daily users, and its aggressive business drive promoting a variety of character products, industry sources said.